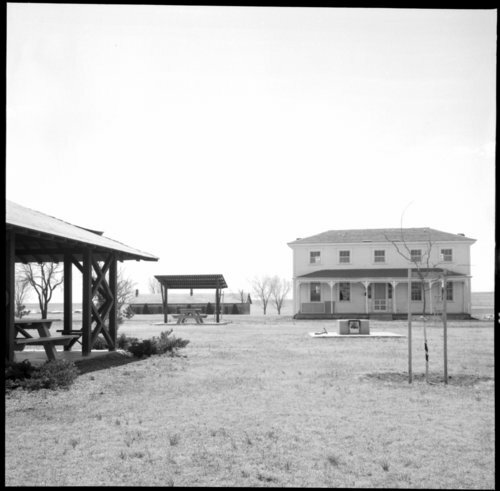 Two photographs of the park area at Fort Hays, Kansas. After its closing in 1889 the land and buildings of Fort Hays were turned over to the Department of the Interior, which later transferred them to the state of Kansas in 1900. When Frontier Historical Park was opened at the site in 1929, only the blockhouse and guardhouse remained of the original fort buildings. The two officers' quarters had been sold at auction in 1902 and moved into town at the time the other buildings were being sold for scrap. The officers' quarters were relocated in 1964 and 1987. The visitor center was built in 1967. Today it operates as Fort Hays State Historic Site; it was added to the National Register of Historic Places in 1971.